Following on from the tepidly popular Roadster, Tesla has entered the UK market once more with the Model S, an electric saloon looking to take on the likes of Mercedes’ S-class and Audi’s A8. Tesla’s future was in some doubt earlier this year due to financial worries, but the Californian firm look to be going full steam ahead with its vehicle development and are hoping for success with its second model. It’s safe to say the battery car market has been slow to catch on, especially in the UK, but Tesla’s ambitions will see the company flesh out its model range and add several new models by 2015. Both small and large saloons and an SUV are hoped to be brought to the market over the next two years, with the Model S the first of these following on from the demise of the initial Roadster. It should be mentioned that the Model S outsold the Mercedes S-class, Lexus LS and the Audi A8 over the pond in the US, and even beat the BMW 7-series two to one. Such success is not expected in the UK, but Tesla is certainly hoping to spur on sales and establish the brand in the British Isles. To make the Model S competitive against its established rivals, Tesla has ensured it can offer the elements seldom synonymous with the usual electric car – performance, size and range. The second commodity in the list is highlighted with a potential seven seats (if you tick the option for the rear-facing child seats for the boot), whilst the 1,800-litre total storage capacity also brings a comfortable feel of space in the cabin. Aluminium makes up a great portion of the car’s build, but still tips the scales at 2108kg. However, 410bhp and 443lb ft of torque helps push the Model S plenty on the road to a top speed of 130mph in the ‘Performance’ version. In regards to range, the Model S has the potential to run 300 miles from a full charge to the next on the NEDC European test schedule (about 260 miles on the US equivalent). This extensive mileage is thanks to a massive 85kWh lithium-ion battery under the floor of the car; for the sake of comparison, that’s four times the capacity of a Nissan Leaf’s. To fully charge the Model S, expect a time of 15 hours charging through a 32-amp UK on-street charging post. For all this, an £80,000 price tag applies if you go for the range topping Performance example. However, an equivalent Audi S8 has a real-world economy that would return 400 miles on a 90-litre fill-up (around £126) and is relatively identical on price and speed, while the Tesla would cost noting when it comes to company car tax and less than £5.00 on an overnight charge – the Audi carries an £11,000-a-year tax cost. The interior takes things up a notch – or a century, even – with a 17in touch-sensitive tablet dominating the dashboard that allows you to control ventilation, headlights, suspension systems and sat-nav and energy usage. There’s a web browser thrown in there for good measure, too. 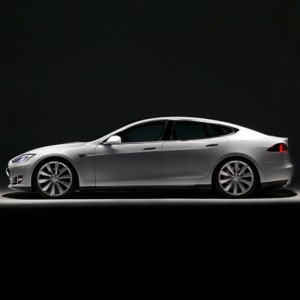 Early first drives have seen journalists describe the Model S as “super-saloon fast” and even pleasurable to drive. Range has found to be close to what Tesla have stated when travelling on motorways, but with added caution in your driving style, the Model S could easily surpass the 300 mile claim and make a big stake in the sector of large, executive saloons. How do we put More Electric Vehicles on the Road?